See today's current mortgage rates. Shop, compare and save. Mortgage interest rates moved slightly higher last week according to Freddie Mac’s Primary Mortgage Market Survey® (PMMS) for the week ending October 10th, 2013. Interest rates on fixed rate mortgages increased for the first time in four weeks, though only slightly, with the 30-year fixed rate mortgage climbing by one basis point to an average of 4.23 percent with an average of 0.7 points. Last week the average rate fell ten basis points from the previous week. 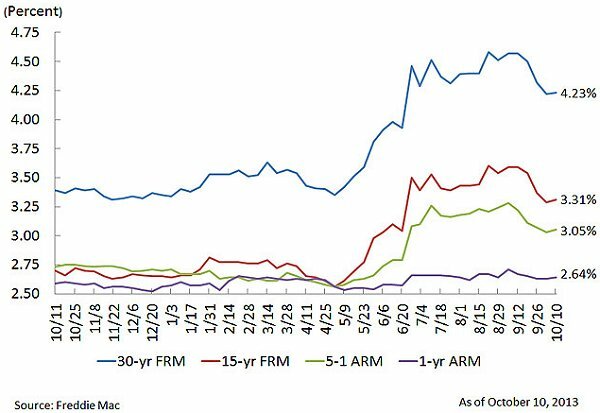 A year ago, the 30-year fixed rate mortgage averaged 3.39 percent. Average 30-year fixed rates were generally the lowest in the Western portion of the United States where mortgage rates averaged 4.18 percent while the highest rates were reported in the Southwestern area of the country where interest rates averaged 4.29 percent. The average rate for a 15-year fixed mortgage was 3.31 percent this week with an average of 0.7 points, up from an average of 3.29 percent last week. At this time last year, the 15-year fixed rate mortgage averaged 2.70 percent. Interest rates for adjustable-rate mortgages were also up slightly this week with the 5-year Treasury-indexed hybrid ARM averaging 3.05 percent, with an average of 0.4 points, up from an average of 3.03 percent last week. The 5-year adjustable rate mortgage averaged 2.73 percent a year earlier. The 1-year Treasury-indexed adjustable rate mortgage averaged 2.64 percent with an average of 0.4 points, up from an average of 2.63 percent last week. A year ago, the 1-year adjustable rate mortgage averaged 2.59 percent. It all starts here. Select the loan product you want to apply for and complete the subsequent questionnaire. Once we receive your completed questionnaire we verify a couple vital pieces of information and direct your information to our network of lenders, all within minutes. With offers in hand you can now compare rates and costs and get the best possible deal. Comparison shopping made easy. You fill out one form and lenders compete for your business. Congratulations! With the great learning tools we provide for you at LoanRateNetwork and the offers you have received, you've found the right product and the best rate. Applying to multiple lenders is fast and easy with our one simple questionnaire. Choose the product you’re looking for, take a few moments to answer a few questions and you’re on your way to saving. Any of the services on our website are 100% free, there is no obligation to use our services or any hidden fees. We’re not loan brokers so we don’t charge broker fees like other websites. No SSN or credit check is necessary to use our services. We bring lenders to you so they can compete for your business and you save. That information only becomes necessary after you choose a lender. What is a HARP Loan? See today's mortgage rates. Shop, compare and save. LoanRateNetwork is an independent marketing leads generator. We are not a loan broker or lender. LoanRateNetwork is an advertising supported publisher and loan rate comparison service that is compensated by third party affiliates for the information you provide to us through the featured placement of sponsored products and services or by clicking on links posted on this website. Not all companies or products are represented through this website. Usage of this site is only available to persons in the continental United States, Alaska and Hawaii. The information contained in this website is for general information purposes only. We make no representations or warranties of any kind, expressed or implied, about the completeness, accuracy, or reliability of the information, products, or services contained on the website. Any reliance you place on such information is therefore strictly at your own risk.